A: We are able to clean approximately 400 square feet per hour. This can vary slightly depending upon the amount of soil, how much furniture needs to be moved, specialty spotting procedures, and setup time. Q: How soon can I walk on the carpet? A: Try to keep pet, children, and heavy traffic off the carpet during the drying process. Wait 24 hours before removing styrofoam blocks or protective tabs that our technicians have placed under the furniture to protect the carpet. Some carpets may feel slightly damp for up to 18 hours depending on the carpet and soil conditions. This is normal and will not cause any problems. A: All of our cleaning packages include moving the majority of furniture in the main living area. (Most companies will charge you extra for this service) Beds, dressers, and heavier pieces are left in place under these pricing structures. Additional charges will apply to move heavier furniture. For liability reasons, we do not move china hutches, entertainment systems, pianos, or other valuable belongings. Q: What about reoccurring spots? A: If a spot returned a day or so after cleaning: it may have been oily or sticky and was not completely removed, or “wicked back” due to the nature of the spot, or possibly it’s not a spot, but a permanent stain. Q: My carpet has bleached or faded spots, can you correct that? A: If you have spots or small areas that have been bleached out, they may be spot dyed, depending on the type of carpet fiber. Q: Can you fix indentations from heavy furniture? A: No guarantee can be made on removing indentations from heavy furniture. In addition to the pile of the carpet being crushed, the backing of the carpet is indented. Heat, moisture, and hand grooming with our equipment may help, but it will take time to release back to normal, if at all. Severe cases may be permanent. Q: How often should a carpet be cleaned? 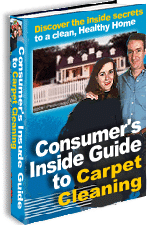 A: No doubt this question has surfaced at one time or another during the years you’ve owned carpeting. The frequency of cleaning will vary from one household to another depending upon the number of occupants and level of usage. At a minimum, you should clean once a year. I have had some homeowners express their fear that once the carpet is cleaned, it will re-soil quicker. This fear is the result of improper cleaning on the part of many cleaning companies. Many of these companies, in an effort to cut costs and save time, will buy the cheapest cleaning solutions, won’t provide the proper training for their technicians, and will not offer a separate rinse step in order to remove detergent residues. If detergent is left in the carpet, accelerated re-soiling will occur. Rainbow Carpet Cleaning uses a more thorough method of cleaning that uses a rinse step after the pre-spray process. This method removes deep down soil and leaves no detergent to accelerate the re-soiling process. The fact is, the best thing you can do for your carpets is have them regularly cleaned by a qualified professional carpet cleaning company. It is the buildup of soil that promotes wear to your carpet, far more than the foot traffic that travels on the surface of the carpet. Foot traffic grinds the soil against the carpet fibers and causes a sand-paper effect. This causes the fibers to dull and become worn looking. Major carpet manufacturers such as Dupont and Shaw Industries recommend that you have your carpets cleaned every 6-18 months, and with most of today’s carpet, in order to satisfy the warranty requirements, you must save receipts from your cleanings. There are other considerations that can increase the frequency of cleanings, such as smoking habits, number and ages of children, soiling conditions, humidity, health status of occupants, allergy conditions, and number and types of pets just to name a few. Heavily traveled areas may require quarterly cleaning, while other less frequented areas may not need cleaning more than every 18 months. Either way, it makes good sense to have your carpets cleaned regularly—not only from an appearance and investment protection point of view, but also from a health standpoint. Regular deep cleaning removes bacteria, dust mites, germs, and the substances upon which these organisms live. Q: Why should I have my carpets protected? A: Dupont Teflon Carpet Protection helps you in two very important ways: When this protective coating is applied to the carpet fibers, it puts a protective barrier around each fiber. This protective barrier resists moisture. When you do have a spill, it gives you a window of time to get it cleaned up. (See our Spotting Guide) The other important way that this product helps you is in the area of wear. Having this protective coating on your carpet helps reduce the wear and abrasion caused by sand in the carpet. This protects the carpet from excessive matting, and in turn will cause your carpet to perform better. A: At Rainbow Carpet Cleaning we can remove any spot that is not a permanent stain. However, there are conditions where permanent staining is present. The following is a list of conditions which may or may not allow spots to be removed. The percentage listed next to the condition is the percentage of CHANCE we have of removing it, NOT the percentage of stain that will be removed. Filtration Soiling (25%) – Filtration soiling is the black marks you see around the edges of your base boards. Typically we can get these lines to lighten, but seldom do they come all the way out. The particles in filtration soil are so fine, and go all the way down the sides of the yarn and through the backing of the carpet. This makes it very difficult to remove.